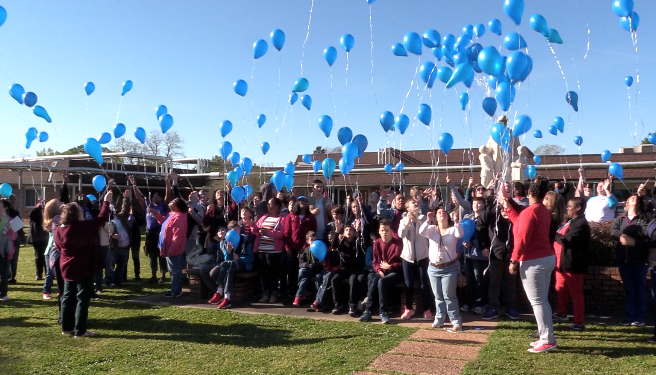 Blue balloons drifted off into the blue sky this morning as residents at St. Mary’s Residential Training School celebrated World Autism Day and officially kicked off Autism Awareness Month. It’s a time to educate the public about Autism and celebrate those who live with the challenges of Autism on a daily basis. “Today is really about creating awareness, understanding and acceptance of people that are on the Autism spectrum.” said St. Mary’s Administrator Christie Guillot. 63% of the residents at St. Mary’s have been diagnosed with some sort of Autism. And, according to the Center for Disease Control, 1 out of every 59 children in America is diagnosed with the disorder. April 2nd was adopted as World Autism Day by the United Nations in 2007.